Favorite item in home: Besides the sauna? I think it is a tie between the pie safe from my grandmother and the Hoosier cabinet that was the first piece of real furniture I bought after we got married. What I'm reading: I'm actually between books right now, so I'm catching up on the stacks of magazines we have (New Yorker, Vanity Fair, Bon Appetit), but the last couple books I read were both memoirs, and both excellent. One was Trevor Noah's book, Born a Crime, and the other was The Glass Castle by Jeannette Walls. Also, I'm reading The Witches, by Roald Dahl to our 5-year-old, Faye. And Goodnight Moon to 2-year-old Holly. Repeatedly. Vera reads everything she can get her hands on, and peppers in re-reading Harry Potter, and John just started the Harry Potter series so he can understand Vera. What I'm listening to: If I am in control of the radio it's NPR. I've been listening to NPR since before I can remember, and I used to work at one of their affiliate stations, so I'm a junkie for it. I jam hardest to Teri Gross. If I'm not in charge of the radio, lately, it's the Moana soundtrack. The girls saw the movie a few weeks ago and we've been listening to it ever since. Did I ever think that I would enjoy singing along to Dwayne Johnson? No. No, I did not. Best food in town: We really like Don Pedro's. John considers himself a connoisseur of tacos and Don Pedro's tacos stand up to any of the Chicago taco joints we used to frequent. We'll often go to Firefly for date night so I can get a nice piece of fish or something. And in the summer we go to Homewood Grill for ice cream - it's a nice little slice of Americana. But, I love to cook, so most of the time we eat in. I do miss the ethnic food you can get in bigger cities, so I'll stock up on groceries from St. Louis (Global Foods international grocery is my idea of a good time) and make it at home. Favorite thing about Effingham: What I like most about Effingham is living on our farmette and having "free-range" children. I love sending the kids outside and telling them not to come in until dinner:) It's how I grew up, and I really enjoy giving that lifestyle to our kids too. 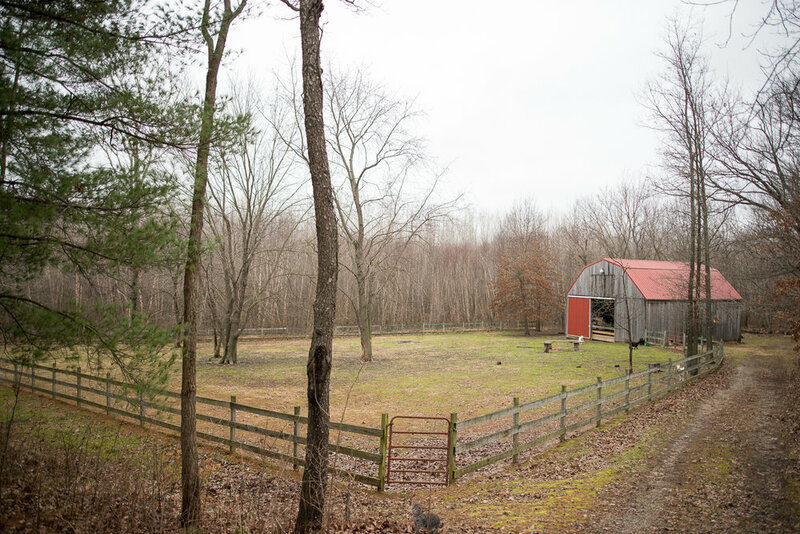 We love our little petting zoo of a barn, having a big garden in the summer, bonfires in the fall, etc. It is hard to not feel like an outsider sometimes since neither of us are from here, but we have made some great friends, and my brother and his family live in St. Louis, so we see a lot of them. What I want people to know about me: Well, geez. I guess I'll say that I'm always up to something. I've always got a project or two percolating or some hair-brained scheme hatching. I love to try new things and I get a lot of satisfaction out of doing things myself - whether it's learning how to install flooring, or make french macarons, or carting the girls off to explore a museum or park or somewhere new. We're always up for an adventure. The John and Helen Pantazis home. In addition to this beautiful home that was built in the late 90s this property boasts a detached two-car garage and a barn. I think it’s very appropriate that the John and Helen Pantazis (pan-TAY-zis) family are featured during the month of Valentine’s Day. They’re the type of couple that when you see them interact you’re like, they kind of make me sick what with their constant and genuine amusement and enjoyment of one another. Helen regularly flashes her beautiful smile at her husband’s jokes and not in the pandering haha that’s funny way but in the I’m genuinely amused by you way. But I guess when you consider all of the places their married life has taken these high school sweethearts from Iowa City, IA you realize that they’ve mainly had to rely upon each other as they navigated new lives in upstate New York, Boston, Seattle, Chicago and now Effingham. Along the way they’ve had daughters Vera (8), Faye (5) and Holly (2). When John got a job with Heartland Dental he convinced Helen that moving from their apartment in Chicago to Effingham would be cool because they could live on the lake. Turns out Helen had dreams of hobby farming so when the homeowners of a piece of property south of Watson walked them around the outside of what is now their home and she saw the barn she immediately knew this was it. They do, however, from time to time get a lake-like experience when Bishop Creek floods. The heart and soul of Helen's farmette. Four years ago the Pantazis family moved from a two-bedroom apartment in Chicago to this four-bedroom home in the country. That meant Helen had her work cut out for her in terms of furnishing it. She said they needed everything from couches to a shovel. She discovered the flea market on Rt. 40 towards Altamont and found many treasures there, including a shovel. Helen loves to do things herself and if the how-to videos on the internet leave her stumped she seeks advice from her dad. Helen replaced her garbage disposal in such a manner. She singlehandedly tore out the carpet in the basement, which she likened to wrestling a bear. She chipped away at various projects like stenciling “wallpaper” in a couple of rooms, laid flooring, painted cupboards, added a backsplash, etc. You’ll see the extent of her DIY-ness as you read. The kitchen island came from the John Boos Showroom in Effingham. Note the popper in the background. Helen isn’t afraid of a little DIY. She replaced her own garbage disposal and installed the backsplash herself. In addition to flea market furniture, she used antiques from her family as well as things she made to fill her home. She went through a pretty intensive fabric arts stage. Testaments to that stage are scattered about the house. She also paints furniture and frames and she builds saunas. More on that later. Helen and I first met at the Effingham Public Library back when it was the Helen Matthes Library. We hit it off and one day she happened to ask if I knew where she could find an old metal desk. Being the hoarder that I am I just so happened to have one in my parent’s barn. She came over and looked at it and said it was perfect, dust and all. In addition to realizing that we both love junk we also realized that we are pretty much the same person. Both of us grew up on a farm, we kind of look the same, we both have a strange sense of humor and we both love junk. Twins. What a great scene. Helen made the throw pillows on the couch, the wall collage was created with meaningful artwork and found frames. The living room furniture was bought online. Here is two-year-old Holly. Helen's Great Uncle built the wooden bookshelf. The Dining Room. They recently celebrated Holly’s birthday and yep, Helen made the happy birthday banner. Her ferns overwinter in the dining room. The dining table was given to her by her parents. In the corner of the dining room sits the Hoosier cabinet that is one of Helen's favorite things. It was purchased at an antique shop when she and John got married and she added her own touch by changing the knobs. The ceramic and gold pots came from Fresh Digs. Helen has a way with vintage pieces. A drink is just around the corner from where guests enter. I love the tray, decanter, feather matchbox combo. In the office. Here’s the desk after she gave it her touch with a few cans of red spray paint. She lost all feeling in her spray finger, but this desk was totally worth it. The pie safe, which was her grandmother’s, is one of her favorite things. I love how she decorates with kitchen implements. For those of us born here, the Effingham area is a wonderful place to raise a family. There’s hardly any crime, we know everyone (heck we’re practically related to everyone), we’ve got caring teachers and great schools and with family so close by babysitters are easily had. Helen has done her best to make the best of being an outsider here. She’s met people at the library, she takes her girls to the Workman Sports Complex and she keeps her sanity by getting the heck out of Dodge to visit her sister-in-law in St. Louis who also happens to be a stay-at-home mom. They shop and drink gin together. More of Helen’s painted furniture is on display in Holly’s room. Helen was rocked as a child in this chair and she remembers tracing her finger on the arms. The lil engraved Boos Block was a gift from Norbert at the Boos Outlet. She got to know him pretty well when her mom came down to shop for her own butcher block. Helen made Holly's quilt and above the bed hangs a birthday present from her mom - a framed picture of Helen as a child. Faye and Vera began sharing this room when Holly was born. Again, Helen made the curtains and bedding during her fabric arts phase. The dresser was Helen’s as a child and she modernized it with a coat of paint. This dresser was Helen’s Dad’s. And she nabbed this other beautiful dresser out of her parent’s basement. She ordered the stack of suitcases from Etsy for her birthday and you guessed it, she made the silhouettes. The hardest part, she says, was getting the girls to stand still. Yes there is a child missing. How fabulous is this? Clean lines and a nice bold color. They recently redid the bathroom and she says yes, she actually uses the tub. This room slays me. Check out our Instagram feed to see some cool shots of Tytia in here. The bed came from an antique shop and the dresser was her grandma’s. Helen did the wall stencil (she clearly has the patience of Job) and the fantastic orange chair came from an estate sale. The adorable kids’ chairs came from Craigslist. And in the background you get a taste of the sauna. The painting on the wall was painted by a friend. It’s Darryl Hall of the group Hall and Oates playing the guitar while Chicago burns. In the barn. Two of the lambs will be going to slaughter soon, she’s presently renting a stud goat and in addition to all you see here she raises pigs in the summer. The chickens are for the eggs and the cats and Jeff the dog are to entertain the children. Imagine it's summertime and everything is lush and green and you're sitting here with a drink in your hand. Paradise. I think everyone needs a giant name sign. A friend found it at an estate sale for $5 and gave it to her. She proudly displays it on her outside patio. About the writer: Joanna Davies is co-owner of Fresh Digs in Effingham, Illinois. Fresh Digs sources locally, globally and uniquely made home goods and gifts. We also like to get people together. Join us.